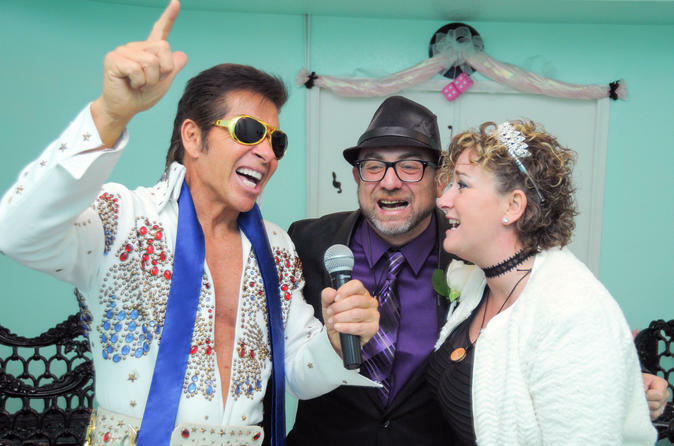 With these Las Vegas Elvis Wedding Ceremony packages you can enjoy Elvis walking you down the aisle and serenading you and your spouse with your favorite wedding songs. Multiple packages are available to suit your every hunk-a-burning-love! Your day begins as you and your spouse ore escorted to the chapel in a luxurious limousine. Upon arrival you will be greeted by your coordinator with a rose bouquet and matching boutonniere, your photographer, and Elvis himself. From there you will be escorted to the chapel where Elvis will serenade you will 3 songs of your choice while you commence your ceremony. As you celebrate your ceremony friends and family are able to view your celebration through a live webcam. After your celebration you will be escorted back to your hotel. Please note: the listed price does not include a minister fee of ($60) and limo fee of ($50).